We seek collaboration and hope to develop further a network of scientists and practitioners with similar interests. Often relatively straightforward measures, such as fitting appropriate nozzles and calibration of existing spraying equipment, can make substantial improvements to the efficiency of application. 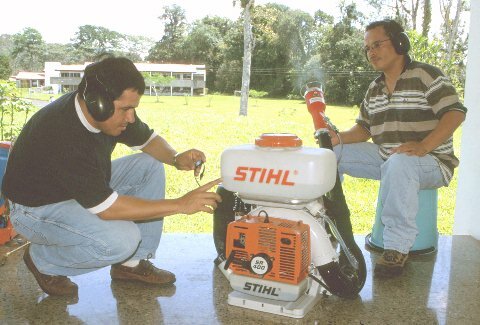 Here, two CATIE scientists (Eduardo Hildalgo and Adolfo Martínez) are assessing the emitted flow rate (amount per minute) of a biopesticide to a rotary Micronex nozzle fitted to a Stihl motorised mistblower.